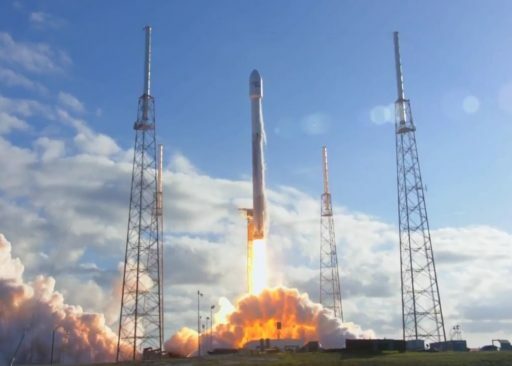 SpaceX’s sixth flight-proven Falcon 9 rocket – sporting landing legs but flying in throwaway mode – blasted into the afternoon skies over Florida’s Cape Canaveral on Wednesday to lift Luxembourg’s GovSat-1 satellite into a high-energy Supersynchronous Transfer Orbit. 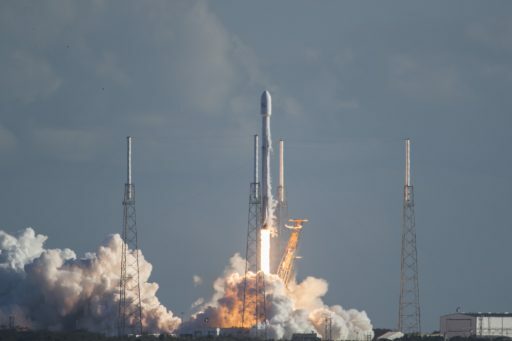 Liftoff from the Cape’s Space Launch Complex 40 occurred at 21:25 UTC, 4:25 p.m. local time and Falcon 9 was in action for just over 32 minutes to dispatch its four-metric ton payload into a highly elliptical orbit peaking over the equator. Wednesday’s mission marked SpaceX’s second flight in what is expected to become the company’s busiest year yet with up to 30 launches. 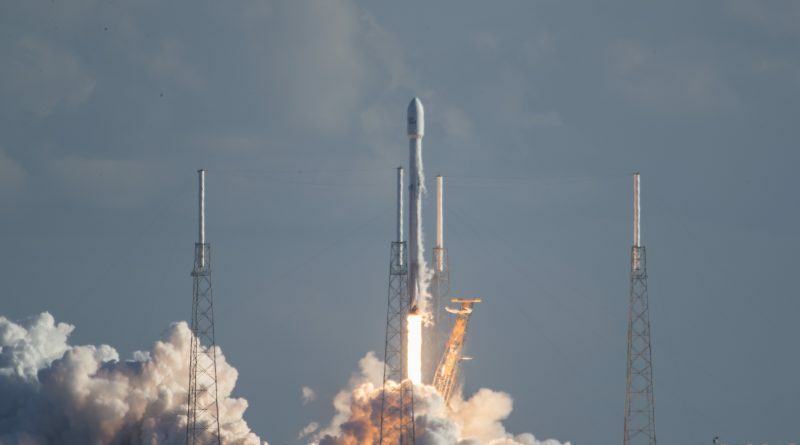 It also was the precursor to the maiden launch of the tri-core Falcon Heavy rocket that is currently next on the SpaceX manifest, having received its first-ever firm launch target – February 6 during a three-hour window opening at 18:30 UTC, though still subject to a number of reviews that need to provide clearance for launch preparations to proceed. The GovSat mission comes after the January 8 Falcon 9 launch with the ultra-secretive Zuma mission that left a lot of discussion in its wake as unconfirmed reports of a failed payload separation claimed the billion-Dollar mission had been lost. 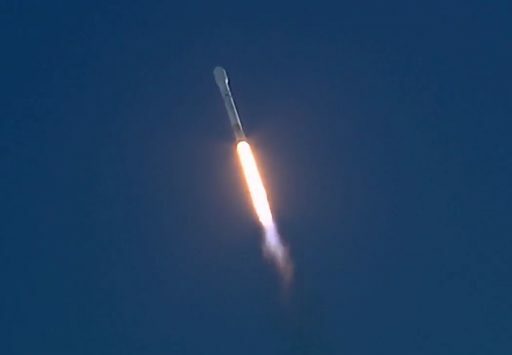 SpaceX maintained the Falcon 9 rocket performed all its tasks during the overnight ascent mission and all data pointed to a nominal launch vehicle performance – still leaving open the possibility that a custom-made payload adapter, built by spacecraft manufacturer Northrop Grumman, malfunctioned. 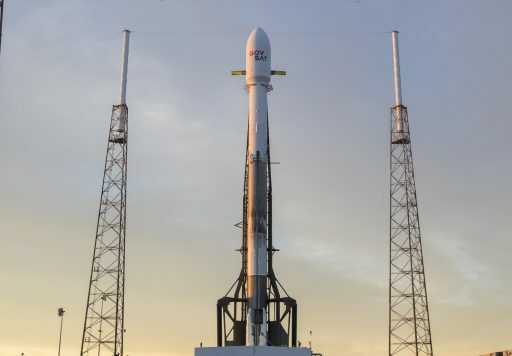 While Zuma is still surrounded by much mystery, SpaceX pressed ahead with the company’s manifest as scheduled – working through Falcon Heavy preparations at Kennedy’s Launch Complex 39A while Space Launch Complex 40 some six Kilometers south supports operational Falcon 9 missions, having re-opened for business in December after over a year of downtime following the AMOS-6 testing mishap. Wednesday’s Falcon 9 mission was tasked with lifting the SES 16 / GovSat-1 satellite into orbit for a mission of over 15 years, delivering tamper-resistant, encrypted communications for European government institutions and NATO members across Europe, Africa, the Middle East and vast stretches of the Atlantic and Indian Oceans. The X- and Ka-Band powerhouse was manufactured by Orbital ATK using the company’s GEOStar-3 satellite platform that debuted just last week on the Al Yah 3 high-throughput satellite. 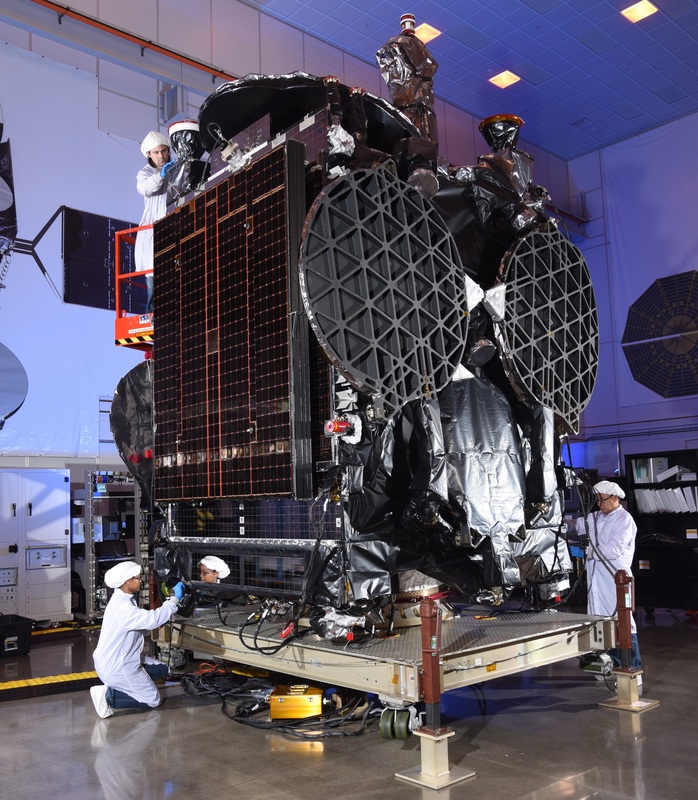 Orbital ATK – tasked with delivering GovSat-1 to Geostationary Orbit for regular service – was hoping for a smoother ride into orbit for their second GEOStar-3 mission after Al Yah 3 was placed in an incorrect orbit last week by its Ariane 5 launch vehicle. The GEOStar-3 platform offers a revamped structure and enhanced electrical power system to support heavier and more power-demanding payloads than Orbital’s predecessor satellite bus and the addition of electric propulsion capability allows for flexible maneuvering and a longer operational life. GovSat-1 was commissioned by LuxGovSat, a joint venture between leading telecommunications provider SES and the Government of Luxembourg, to provide secure communications services under Luxembourg’s obligations to NATO while leftover capacity will be made available to government and institutional customers in need for jam-proof connectivity. 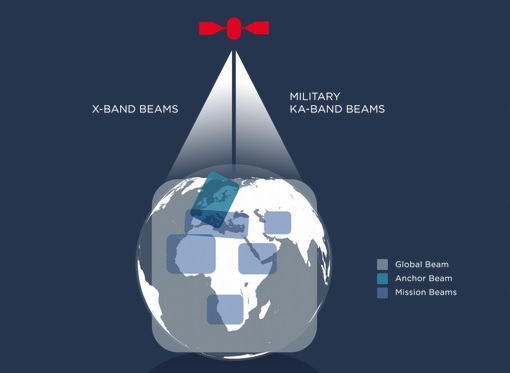 Outfitted with the equivalent of 68 X- and Ka-Band transponders, GovSat will combine a global X-band beam for wide-area communications, a European Anchor beam to interconnect agency headquarters and six high-powered, fully steerable spot beams that can direct focused capacity wherever it is needed, whenever it is needed. Services supported by the satellite include secure radio communications, data-intensive applications, mobile communications and Intelligence, Reconnaissance & Security services. GovSat-1 was financed with €50 million from each of the two partners plus a €125-million loan from a Luxembourg bank consortium, covering the funding cost of the joint venture, the GovSat-1 satellite and Falcon 9 launch services. 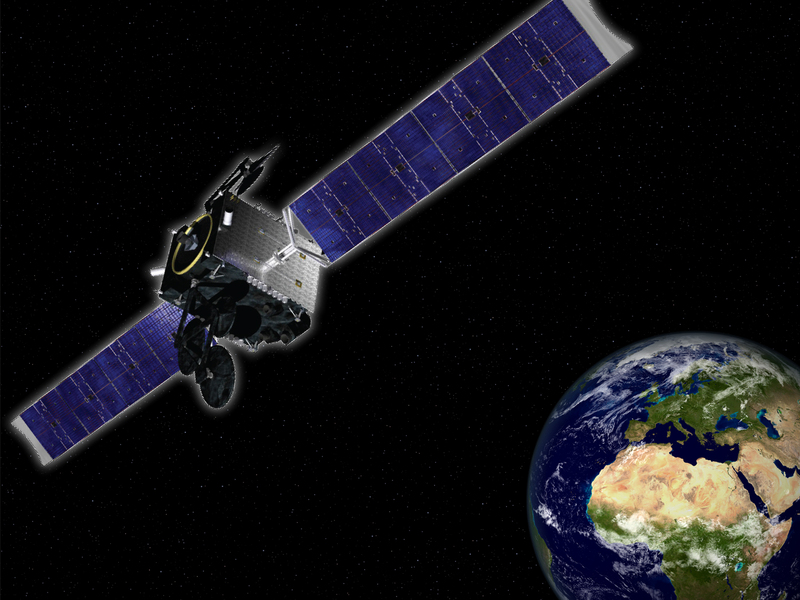 LuxGovSat is the first public-private partnership offering satellite communications in the government frequency bands, catered to customers looking for secure and robust satellite communication links – provided by the X-Band payload – and communications on the move, realized via the Ka-Band payload. Targeting a position at 21.5°E in Geostationary Orbit, GovSat-1 will operate for at least 15 years and carries fuel for over 16 years of active service. Wednesday’s launch was SpaceX’s sixth mission with a previously flown first stage, the third with SES involvement after the company placed their SES 10 satellite on the very first ‘flight-proven’ Falcon 9 in March of last year followed by the launch of SES 11 in October. SES has been one of the ‘early adopters’ of the innovations SpaceX had to offer – placing trust in the California-based company in 2013 when putting SES 8 on the first Geotransfer flight of the Falcon 9 rocket and again in 2016 when SES 9 flew on the first GTO mission of the upgraded Falcon 9 Full Thrust vehicle. In use on Wednesday was Falcon 9 Booster #1032, conducting the second flight of its career after giving a lift to the classified NROL-76 satellite on May 1st, 2017. That mission had a fairly benign flight environment in store for the Block 3 booster, allowing it to return to the Space Coast with minimal wear and tear. Still sporting its sooty attire from the previous voyage, Booster 1032 fired up last Thursday for the usual hold-down test performed by SpaceX ahead of every launch and of particular importance for re-use missions that do not undergo re-acceptance testing at SpaceX’s Texas site. Falcon 9 received its 4,230-Kilogram payload over the weekend and was wheeled back out to the launch pad in the early hours on Tuesday. SpaceX’s Drone Ship was sitting this mission out at Port Canaveral as the Block 3 booster was earmarked for retirement via a watery grave as it lacks the provisions for multiple re-flight missions the newer generation boosters have. However, the booster was equipped with landing legs and grid fins, indicating SpaceX was planning another round of post-separation testing of the vehicle, likely in a data-gathering effort in flight environments that can not be experienced in operational return missions. The same had been done in December on the Iridium-4 mission, but that flight’s booster only sported fins for its soft splashdown attempt in the ocean. Spending an additional night under the Florida sky after Tuesday’s launch delay, Falcon 9 was lowered to its horizontal position to allow engineers to replace a faulty sensor on the rocket’s second stage before it was once again raised to its vertical position, towering 70 meters over the grounds of Pad 40. 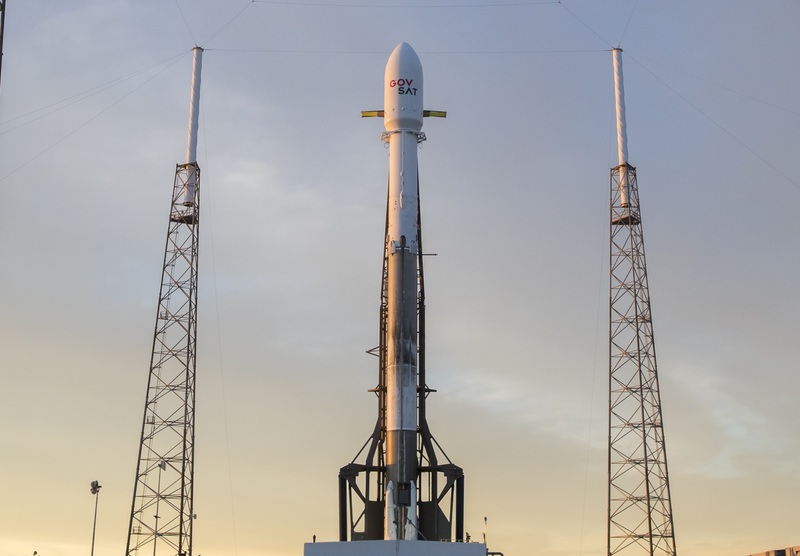 Falcon 9 headed into a lengthy countdown in the morning, local time, with several hours of checkouts and final hands-on work to ready the SLC-40 ground system for propellant loading. Two Launch Control Rooms at the Cape and engineering support in California were polled before computers were handed control of the count at the T-70-minute mark for the fast-paced tanking sequence. 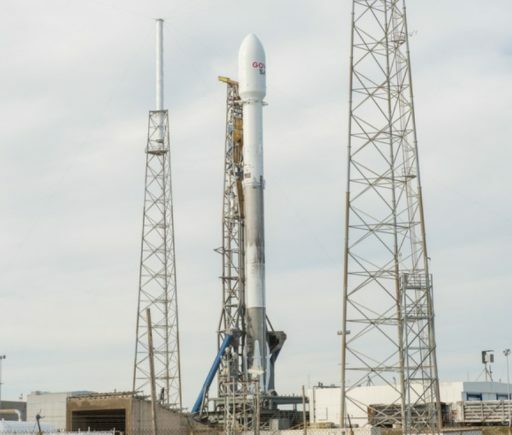 Falcon 9 went through final flight control preparations and GovSat-1 switched to battery power while over 500 metric tons of rocket-grade Kerosene, chilled to -7°C, and sub-cooled Liquid Oxygen at -207°C were pumped into the vehicle. The start of engine chilldown at T-7 minutes marked the beginning of a rapid sequence of events to configure Falcon 9 for flight – putting onboard hydraulics through a final checkout, switching the two-stage vehicle to internal power, priming the Strongback for rapid retraction and arming the rocket’s autonomous destruct system. Falcon 9 finished propellant loading at T-2 minutes and its triple-redundant computers assumed control at T-1-minute for the final pressurization of tanks and ignition of the engines – signaled by the typical green flash of Falcon’s igniter fluid. The 550-metric ton launch vehicle took flight at precisely 21:25:00 UTC when its nine Merlin 1D engines lifted Falcon 9 off the pad with a collective launch thrust of 700 metric ton-force. Clearing its tower, Falcon 9 pitched and rolled to attain a south-easterly heading as it embarked on its first Geotransfer mission in three months. Active propellant utilization kicked in around half a minute into the mission to deliver an optimized propellant mixture to the engines, consuming 2,450 Kilograms of propellant each second of powered flight. 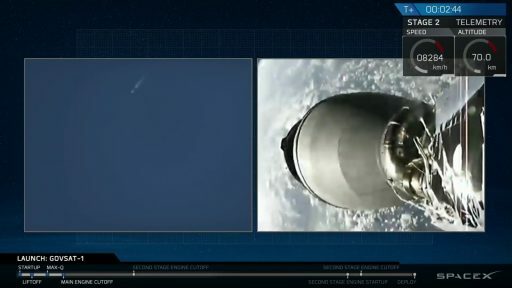 Falcon 9 soared through the sound barrier just over a minute into the mission and the engines throttled back briefly as the vehicle headed through Maximum Dynamic Pressure at T+78 seconds. The first stage fired for two minutes and 38 seconds, just around five seconds shy of its maximum possible burn time to deliver the performance needed to send GovSat-1 toward its high-energy target orbit. MECO occurred after the first stage accelerated the stack to a speed of 2.32 Kilometers per second and the two stages of Falcon 9 parted ways two seconds later via four pneumatic pushers. The second stage immediately fired up its MVac engine, soaring to a thrust of 95,000-Kilogram-force on a planned burn of five minutes and 54 seconds to lift the stack into a slightly elliptical Low Earth Transfer Orbit. 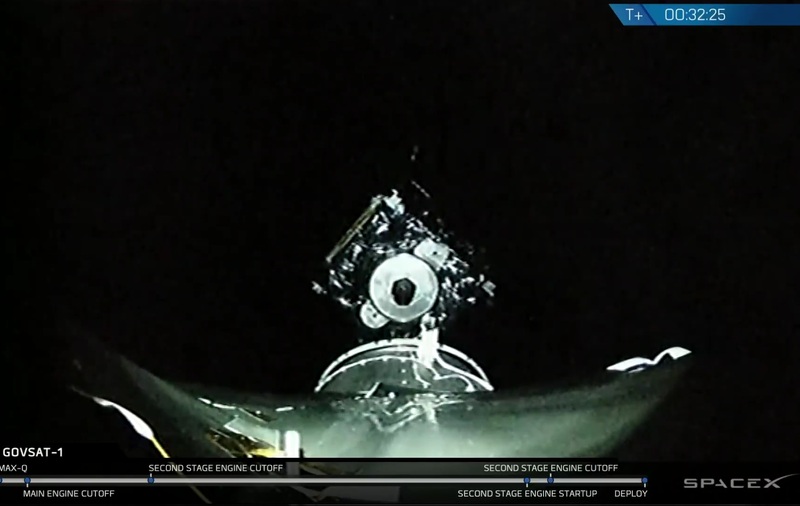 Passing 111 Kilometers in altitude just before reaching T+4 minutes, Falcon 9 dropped its 13-meter long fairing halves to shed no-longer needed weight. SpaceX has quietly continued progress in the area of fairing recovery, deploying a new contraption for the company’s west coast launches via the sea-going vessel ‘Mr Steven’ that is equipped with a four-armed device designed to catch descending payload fairing halves – presumably with a net between the arms. The company does not yet have this capability on the East coast, but SpaceX’s Go Quest and Go Searcher support vessels departed Port Canaveral on Saturday – either to observe the soft landing of the first stage, fish a fairing out of the water or both. Stage 2 shut down eight minutes and 34 seconds after liftoff, transitioning into a passive flight phase of nearly 19 minutes to continue on its south-easterly flight path so that the apogee boost could center the equator and thus position the high point of the resulting orbit over the equator. While crossing the Atlantic, the second stage traversed a communications black zone before being re-acquired via the Gabon tracking station that oversaw the critical second burn. The MVac engine re-ignited 26 minutes and 44 seconds into the flight to significantly raise the apogee of the orbit, placing it above the Geostationary Belt, and also reducing the orbital inclination. Falcon 9 was programmed to execute a minimum-residuals shutdown – firing its engine until all but a minimum of propellant on the second stage was expended – allowing the stage to operate longer than for a guided shutdown and so deliver some additional delta-v to put the satellite into a higher orbit with the goal of reducing its fuel expenditure toward GEO. The burn had a planned duration of 68 seconds, but appeared to run a few seconds longer than that, indicating Stage 2 had some reserve propellants to give GovSat-1 an additional boost. The delta-v for the second burn was 2.64 km/s which should result in an apogee altitude well over 40,000 Kilometers. 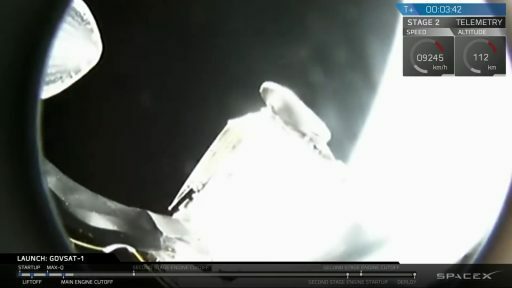 Set free from Falcon 9 at T+32 minutes and 20 seconds, SES 16 / GovSat-1 headed off to Geostationary Orbit – targeting a series of apogee maneuvers to circularize its orbit and reduce the inclination to zero to enter its operational slot, interlocked with Earth’s rotation to remain centered above the same coverage area.